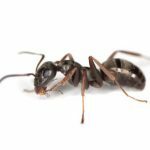 Odorous House Ants invade homes and nest in cracks, wall voids and attics. They are a real nuisance to homeowners and will persist if not treated properly. It’s best to leave this pest to the professionals. They are known to have small numerous nests in and around the structure and if treatment isn’t done correctly the problem will get worse.